Though we think of it as a vegetable, cucumber is the refreshing fruit of a creeping vine. It is part of the gourd family that includes melons and squashes. It originated in India, but is now cultivated worldwide. Why is it so refreshing? It is usually more than 90% water. 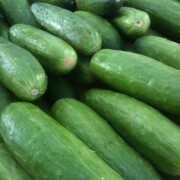 Cucumbers are also known for their phytonutrient content and as a traditional dietary cleanser. – Always wash your cucumbers well before using. Some recommend scrubbing gently with a vegetable brush, as cucumbers imported from out of state almost always are waxed. – The cucumber end rubbing technique known worldwide actually has an official term in Japanese cookbooks – aka nuki. Many believe that cutting the tip off the cucumber and rubbing it in a circular motion on the cut end draws out the remaining bitterness in a frothy foam. This should be performed on both ends, before peeling, and the foam should be washed off. Many also believe that that this kitchen ritual developed at a time when most cucumber varieties contained a bitterness that has since been bred out. Massaging cucumbers in salt is another aka nuki technique. – Cucumbers are mainly eaten raw, simply sliced in salads or dipped in dressings. – Cucumbers are also widely preserved using salt methods or vinegar methods. – In France, cucumbers are sauteed and regarded as a nice warm and delicate accompaniment for a dish. Look for cucumbers that are firm, heavy for their size and a bright medium to dark green. Avoid cucumbers that are yellow, show any wrinkle or sunken areas. Cucumbers are very heat sensitive and should not be left out at room temperature as they will start to wilt. Store cucumbers unwashed in plastic bag in veggie bin of the refrigerator where they will keep for up to 3-4 days. Leftover cut cucumber will keep for a few days refrigerated in a tightly sealed container.